Oh and since a lot of Kobe stans and others like throwing about the "ring" argument, allow me to say here.....3 rings don't lie. First of all, you guys living in the past if you think Wade is even close to Durant today. He isnt. Based on the last 2 seasons, Wade frankly isnt a top 10 player. Everyone keeps saying "when healthy"....he aint ever healthy, that excuse can only last so long. Also, Durant has had what realistic chances of a championship? Heck, maybe only 1 chance. Its no garentee he will win a title, no, but as already said, if (for me when) he does get one as the man, he already surpassed Wade. Wade in 06 was great, but without Shaq he dont win anything. Not to mention the very worst officating performance of all time (putting aside Lakers vs Kings) Wade getting to the FT line all those times with phantom fouls were at least half the reason he got that first title. And his "make him respect place in history" makes no sense. His win over Durant was Lebron carrying him there, something I find shocking to say but frankly the truth. If Lebron said it to Durant, but Wade? What did he do? @The Franchise wrote: First of all, you guys living in the past if you think Wade is even close to Durant today. He isnt. This is one of the most asinine BS fans keep making noise about today. Yes, the officiating was questionable a lot of times, more so than a lot of other series, but its not like Wade wasn't attacking the basket relentlessly. What that whole conspiracy theory comes from is that no team had ever come back from being 2-0 down in the Finals iirc. And they were the underdogs, without question. Wade stepped up massively, Dirk & JT and the rest of them chocked massively. I'm just summarising my thoughts on that BS theory right now. I'll give an extensive view on why that's such a silly myth some other time. Yeah he was attacking, and getting bailed out with 2 free throws when it should of been no calls. Whats the bs exactly? That Wade was actually fouled that many times? And why say "fans"? Are Phil Jackson and T-Mac fans too? Tmac went as far as to say "it looked rigged". The qoutes are all over the place, they found it totally incredible also. Im sorry, Wade was an incredible player, but that was some bogus reffing. That wasnt the ONLY reason the Heat won, not at all, but to say those calls were fair makes no sense. Not that it really impacts his legacy, he isnt any less of player because of it, but people and now himself talk about him in a light he doesnt really deserve. Especially today. How can you possible call him a top 10 player at this point? He averaged 16 points a game in the playoffs for chris sake. There's nothing asinine about saying that D-Wade got every call that series. That's where people started calling him D-Whistle. In the previous 19 playoff games that season Wade shot more than 16 one time. He then has 18+ in 3 of the next 4.
game 5, Mavericks FTA: 25, Wade by himself: 25. But it was how he got the calls, phantom fouls all over the place. And I wasn't incorrect about any of what I said. I said per 36; in the mins Shaq was on the floor he was close to as productive as he was the last few years in LA. @The Franchise wrote: Yeah he was attacking, and getting bailed out with 2 free throws when it should of been no calls. Lord knows how many times Jordan got this treatment in his career. Especially during his second threepeat. Ask Avery Johnson who had no idea how to defend against Wade either. That's like me saying UEFA rigged the Barcelona-Chelsea CL semi-final 2nd leg in 2009. I may say that to poke fun once in a while but at the end of the day that's a stupid conspiracy theory with no basis or evidence whatsoever. Its nothing more than a case of an incredibly incompetent ref who ruined the match and if there was a conspiracy, it probably stated and ended with him and him alone. Same thing goes for the NBA too. The fact that people think the NBA orders refs to call a game in favour of one team or the other is just laughable. But I guess people always want to have some type of conspiracy to talk about. I don't know any major league in the world in any sport that doesn't have conspiracy theroies. Every sport from football to basketball to American football to baseball to boxing to poker to gymnastics etc. Conspiracy theories everywhere. Nothing new. Oh and I seem to remember various coaches and players crying conspiracy theory for the Chelsea-Barca semi too(including Mou). That doesn't change how outrageous it sounds. Jordan used to get damn near those numbers in a lot of series. But Jordan is untouchable to NBA fans so I guess we'll let it go. I never once said they were fair calls. If you read my post again, I even said there were a lot of questionable calls. I never even called him a top 10 player straight away. I said "when healthy" and you or anyone can try to rebuff the "when healthy" thing because of how rare that has been in the past 2 years but facts remain facts. When he's healthy, there aren't a lot of players that can match his dominance on the court. Certainly not James Harden. "So who would you replace with Harden in the top 10?" I don't think he would have sparked anything that way. But that's not my problem anyway. I'm certainly not complaining. @dmize wrote: There's nothing asinine about saying that D-Wade got every call that series. That's where people started calling him D-Whistle. Right. And the Mavs never fouled at all. They defended the same way they defended in games 1 and 2, didn't they? Its one thing to say he got questionable calls, which is fine, he actually did. But to try to paint every foul called in his favour as unfair is just laughable. Okay maybe he shoots 24 FTs and of those 12 fouls, 3 were questionable. Fans would ignore the other 9 just to prove a point of the series being rigged. Its just the way it is, unfortunately. I was arguing with someone on this same thing on another forum some months back and someone backed me up with pictures of the Mavs players literally pulling Wade's jersey mid-air, pulling his elbow, etc. I'm having a hard time finding those pics now but I'll post them immediately I find them. Fouls like that are ignored for the ones that can support the "rigged series" argument and its just comedy all round. And those numbers I showed you were per 36 in the playoffs. I don't think you clicked that link. D-Wade is a legend and his USA teammate, I was surprised when I heard what KD said tbh.. 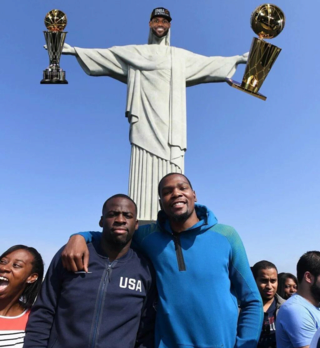 They were never USA teammates btw. Every star player gets calls, its not new. But what Wage got was above and beyond anything I ever seen from an individual player. Comparing it to Barca makes no sense for a number of reasons. But that would be off point. The point I am making is not that McGrady thought it was rigged, he didnt say that, he made the point that the reffing was so bad it "looked" rigged. Phil Jackson said nothing of conspiracy, he said that "the refs made him untouchable". There is no conspiracy talk from me, or them, purely that the ref was horrible and played a huge part in the win. Thats all thats being contested. Not that the refs intentionally wanted Wade/Miami to win. Difference between cheating and incompetence, I am saying the latter. Nope, Jordan never got 63 FT's in 3 games. I never seen that, if you have evidence then go ahead. I bet he never even got that many FT's vs the Bad Boys, who actually tried to foul him. Your last 2 paragraphs I dont understand your point. So, you agree he is never free of injury...therefore, he isnt a top 10 player? Stupid for Durant to say it? Not really. What is Wade going to do about it? As motivated as he wants to be, he will just be injured yet again if the 2 meet. I doubt Durant cares. I have no problem with Durant saying it how it is, the obvious answer on who should come of the top 10 is Wade. I was comparing the officiating to Ovrebo's officiating, but yeah I get your point now. I think I misread your initial post. Anyway, I believe Wade is going to be healthier this year than in the past 2 years. Maybe not quite 2011 healthy but at least a lot better. Why? Because he's back with Tim Grover now. That sounds pointless but Wade had his best years with Grover as his trainer. It may very well be what he needs right now to be healthier. One thing's for sure, he's not gonna take any game vs OKC or Houston as just "any other game." @Blue Barrett wrote: They were never USA teammates btw. Yeah Grover, we have to see. Wade has employed an aggressive and at times wreckless style for years now, so many spills and falls. Plus, he is much stocker then his prime years and think he needs to slim down. He actually has lost a lot of weight over the summer according reports. I'm ignorant here but I don't know how his weight has affected his injuries tbh. Its one thing to say he got questionable calls, which is fine, he actually did. But to try to paint every foul called in his favour as unfair is just laughable. I said he got every call. He got the legit ones and he got the questionable and bs ones. edit: and 20/11 in the playoffs doesn't exactly disprove what I said. He was still the best C in the league. His final year in LA playoff numbers = 18.6 and 11. He went up from there. Some statlines Shaq put up in the 'offs: 27/16/5blks, 30/20/5/2, 27/12, 28/16. He had 2 horrible games in the finals and they lost both by double digits. Well the more weight you carry, the more stress you put on your joints, tendons, ligaments and so on. Especially knee and ankle. Obviously its not quite as simple as less weight = less injuries or the opposite, but the first sentence is the most basic explanation of it. Of course not everyone is the same and genetics play a role in what your body can handle. Many guys have taken to dropping weight recently, especially the older guys who werent even big to begin with, Kobe, Duncan and Amare being 3 guys who come to mind. I'm sooo f*cking excited about this season. I think we finally have a team that has a realistic shot at making the final. College hoop watchers, yall really gotta let me know how this dude goes because man, he is doing some crazy stuff. Yeah he chose my schools rival, so I won't be diggin him much. But kid is definitely going top 5 next draft. The only worry I hear about is he is a classic tweener. 6'8, 210. Not powerforward size at the moment, but thats going to be his position so I hear.